Grim, imposing, monolithic, uniform – the words used to describe paneláks are on the whole negative. These communist era pre-fab concrete apartment blocks symbolize for many everything people hated about the former system. They were lifeless, boring and constraining. No wonder former president Václav Havel referred to them as kralíkárny – rabbit hutches. Yet, however maligned, these experiments in urban planning have their own story. My first four years in Prague were spent in three different paneláks. My assumption pretty much fit the views above. These great gray walls with their tiny windows were obviously where humanity went to die. How could anything good prosper here? Time changed these early impressions. Admittedly, my flats didn’t have the high-ceiling chic of those in Prague’s historical districts, but I quickly found that far from being ready-made symbols of boredom and alienation, they were places with variety and even community. The interiors of the flats were as varied as the occupants. The fixtures in rentals of mine and my colleagues’ were usually modestly furnished, but everyone made it into a home. And the panelák didn’t inhibit us from socializing. We had parties, dinners, film nights. As I said, people got on with their lives. The flats belonging to friends and family would be decorated according to taste and budget. I’ve seen everything from book-lined rooms to walls decked in wood paneling, antique furniture to suites bought straight from Ikea. The outside is no indication of the inside. Sure, I had surly neighbors, who only greeted me with a grimace. And I was privy to the arguments of the couple above as well as to their – ahem – reconciling. But my neighbor in the first flat was friendly and collected my parcels when I wasn’t home. (Yes, she gave them to me when I arrived.) An old woman across the hall in the second block I lived in made small talk. In the end, the most striking aspect of life in the paneláks was how ordinary it was. Kids played in the spaces between. People came and went to work. Others took their dogs outside. There always seemed to be a lot of dogs. Basically, the occupants just got on with their lives. If anything, the blocks were more like self-contained suburbs. This comparison might not be overly positive, but it was far from the simplified image I’d brought with me. The panelák may embody communism, but some of the design principles go back to the green city movement, which influenced the construction of Zlín, and the philosophy of Le Corbusier, who envisaged cities of large apartment blocks around transport hubs. In the 1930s in the Czech Republic, housing estates were already taking shape to meet the demand of people coming into the city. From 1900 to 1925, the city’s population had more than tripled, reaching 700,000 inhabitants. But it was the communists who really encouraged the prefab boom. Paneláks fit, at least superficially, with official ideology. They would provide affordable housing for all in environments which would promote social living with green spaces, playgrounds and social clubs. They would also withstand a firebombing attack. The first panelák went up in 1955 at 771 U Prefy Street in the Prague district of Ďáblice. It has twelve apartments, each measuring 100 m2. The building is quite small compared to the latter day behemoths, though the flats themselves sound pretty spacious. Unlike more recent blocks, this one has a sloping roof. From this time both the number estates and size of paneláks grew, reaching the 300m long giant on Zelenohorská Street in Prague 8. That’s about the length of three American football fields end to end. The block runs almost the whole length of the street. If you’re curious, you can see it courtesy of Google Street View. The earlier estates, such as Krč, Novodvorská, and Malešice, were praised for maintaining ‘continuity with modernist ideas’. However, standards didn’t last, and by the eighties the estates were becoming increasingly monotonous in design, and the building material poorer in quality. Mostly, eight basic designs (scroll down link) were used. Any variation was, as you can see in the link, minimal. Sound and heat insulation are common criticisms – hence my all too detailed knowledge of the lives of the people above me in my second panelák flat. 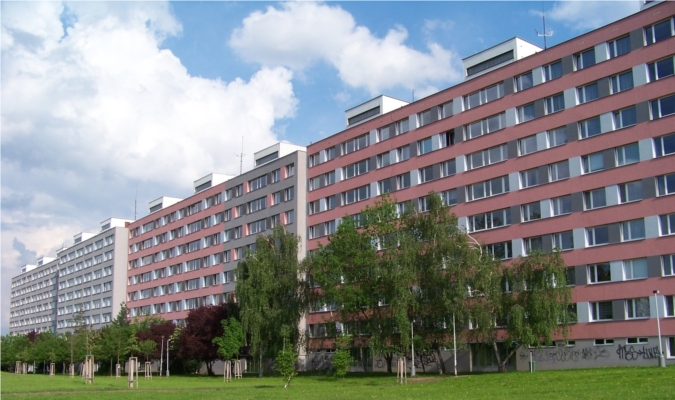 Jižní Město is particularly notorious for the decline in standards, as authorities pressed more limited designs to cut production costs and house more people. Life in this quarter of Prague was frenetically captured by legendary Czech film maker Vera Chytilová in her film Panel Story. There are no subtitles with this link, but the visuals make a strong impression. Despite the negative views, paneláks continue to house about a third of the Czech Republic’s citizens, and account for one half of existing apartments. Unlike in English speaking countries, these buildings don’t only house people at the low socio-economic end of the spectrum. Professionals and middle-class people also make their homes here. At the same time, some paneláks have become the dwellings of the marginalized and as such attract criminal elements or become run down. It’s fair to say there are a myriád of reasons for this which go beyond architecture. Recent attempts have been made to spruce up paneláks. Insulation has been added to the exterior and the buildings have been given a bright facelift. While this was a welcome change from the dull gray, in some instances it seems like the people in charge went overboard with the colors. If you want to get a sense of the panelák’s place in Prague history, visit the free exhibition Prague Panel Housing Estates at the Old Town Hall on the Old Town Square, which is running until 16th September. In this somewhat small exhibition, the ideas and designs as well as their execution are set out in mock paneláks. As you wander from each, you see in miniature the story of this building and learn how ideals were often undercut by politics and the demands of the system. Moreover, you see how top-down the enterprise was. The buildings were design for people with no consultation or even consideration of what people were like. Some may say things have changed only to stay the same. The highlight of the exhibit was the model of the Nové Butovice estate. A row of paneláks snake across the landscape, looking more like a fortification than a residential area. If there is one criticism, it’s a shame that the exhibit doesn’t have more about the lives of the people in these estates. The technical and historical aspects are interesting, but the exhibition unwittingly reproduces the very problem with the estates – the absence of the human element. The overly negative stereotype of paneláks is in part unfair. Aesthetically, they might not be everyone’s cup of tea, but to see them simply as lifeless edifices ignores the lives that were going on and still do. What are your thoughts on the Czech Republic’s ubiquitous panelák?